The Renault Formula One crash controversy, dubbed Crashgate by some in the media, was a sporting scandal caused by the Renault F1 team, which ordered Nelson Piquet Jr. to deliberately crash during the 2008 Singapore Grand Prix, to give a sporting advantage to his Renault teammate Fernando Alonso. On 28 September 2008, on the 14th lap of the Singapore race, the Renault R28 driven by Piquet crashed into the circuit wall at turn 17, necessitating a safety car deployment. The other Renault driver, Fernando Alonso, had previously made an early pitstop, and was promoted to the race lead as other cars pitted under safety car conditions. Alonso subsequently won the race after starting 15th on the grid. Piquet described his crash at the time as a simple mistake. After being dropped by the Renault team following the 2009 Hungarian Grand Prix, Piquet alleged that he had been asked by the team to deliberately crash to improve the race situation for Alonso, sparking an investigation of Renault F1 for race fixing by Fédération Internationale de l'Automobile (FIA), the Formula One governing body. After an investigation, Renault F1 were charged with conspiracy on 4 September, and were to answer the charge on 21 September 2009. On 16 September Renault stated that they would not contest the charges, and announced that the team's managing director, Flavio Briatore, and its executive director of engineering, Pat Symonds, had left the team. On 21 September it was announced that the Renault F1 team had been handed a disqualification from Formula One, which was suspended for two years pending any further comparable rule infringements. Briatore was suspended from all Formula One events and FIA-sanctioned events indefinitely, whilst Symonds received a five-year ban. Their bans were subsequently overturned by a French court, although they both agreed not to work in Formula One or FIA-sanctioned events for a specified time as part of a later settlement reached with the governing body. The Renault F1 Formula One team came into existence with the car manufacturer Renault's re-entrance into Formula One in 2000, by purchasing the Benetton Formula One team. Italian businessman Flavio Briatore had been managing director of Benetton until 1997, when he was replaced by Prodrive boss David Richards. After managing Renault's motorsport sister company Mecachrome, he returned to the main team following the Renault takeover, again as managing director. In addition to his Formula One sporting interests, as of August 2007, Briatore was Chairman and part owner of the English football club Queens Park Rangers F.C. (QPR), which he purchased jointly with Formula One president Bernie Ecclestone, being joined later by funds from Indian industrialist Lakshmi Mittal. Spanish racing driver Fernando Alonso had been involved in Formula One since 2001, and drove for the team from 2002 to 2006. After becoming World Champion in 2005 and 2006 and a one-year stint with McLaren, he returned to the team in 2008. English engineer Pat Symonds had risen to his position as Executive Director of Engineering with Renault F1 having worked for the Benetton team, and having entered Formula One with Benetton's predecessor Toleman Motosport in the early 1980s. Brazilian racing car driver Nelson Piquet Jr. – son of the Formula One triple-world champion Nelson Piquet – joined the Renault F1 team as the second car driver alongside Alonso for the 2008 season, having been their reserve and test driver during 2007. Since October 2006, Piquet Jr. was also personally contracted to Flavio Briatore's management company FFBB. Before the Singapore incident, Renault F1 had not won a race for almost two years (the last Grand Prix won was on 8 October 2006, the Japanese Grand Prix), and were said to be close to quitting the sport. The 2008 Singapore Grand Prix was the fifteenth race of the 2008 Formula One season, and took place on 28 September 2008. The race was Formula One's first night race. On the race weekend, despite Alonso being close to the top in practice, Renault had a poor qualifying session and started well down the grid, with Fernando Alonso starting in fifteenth place, and Nelson Piquet Jr. alongside him in 16th. Alonso was eliminated during qualifying because of mechanical failure. After the race started, Alonso was the first driver to make a routine pit stop for fuel and tyres on lap 12, rejoining the race at the back of the field. He had put in a light fuel load at the start of the race in an attempt to pass the cars in front of him; most drivers that qualify in low positions tend to do the opposite and go for heavier fuel loads to make one less pit stop (approximately 30 seconds each in terms of time loss) than the leaders, as they do not want to waste a light car and an extra pit stop for a faster car that is stuck behind slower vehicles. Three laps later, Nelson Piquet Jr. hit the circuit wall at turn seventeen, one of the turns on the circuit which did not have a crane nearby, necessitating the deployment of the safety car. Safety car regulations in 2008 meant that the pit lane was closed until all cars had been bunched up behind the safety car. Hence the advantage of the lead cars would be eliminated before they were able to pit and after they did pit, they would re-enter the race at the back of the field. Alonso, having pitted just before the safety car was introduced, therefore gained a significant advantage. (Under previous regulations, the pit lane remained open during safety car incidents and the lead cars could quickly pit before their lead was eliminated and re-enter the race with less loss of track position.) In order to avoid running out of fuel, some drivers did need to pit while the pit lane was closed and they were penalised for the infraction. Most of the leading cars ended up behind Alonso and also behind some slower drivers who proved difficult to pass on the narrow circuit; those ahead of Alonso were lighter on fuel and whilst they were able to pull away, they still needed to make a pit stop. After gaining the lead in the final third of the race, Alonso went on to win the race. A first podium of the season and first victory as well and I am extremely happy. I cannot believe it right now, I think I need a couple of days to realise we won a race this year. It seems impossible all through the season to be close to the top guys and here suddenly we have been competitive from Friday. Obviously we started at the back and the first safety car helped me a lot and I was able to win the race. —  Fernando Alonso after the race, his first win of the year. From the start of the race things were complicated and I had a lot of graining and the situation got worse and worse. The team asked me to push, which I tried to do and finally I lost the rear of my car. I hit the wall heavily but I'm OK. I am disappointed with my race but obviously very happy for the team this evening. —  Nelson Piquet Jr. after the race. No action was initially taken over the crash. Piquet Jr. initially characterised the crash as a simple mistake. In the post-race press release from Renault F1, the team described Alonso's performance as a "brilliant tactical drive", while both Briatore and Symonds attributed the safety car use as a case of good luck. Following the race, freelance Formula One journalist Joe Saward, writing on grandprix.com, stated that "some cynics" were questioning the incident, but dismissed it with the opinion that "one likes to believe that no team would ever be so desperate as to have a driver throw his car at a wall". 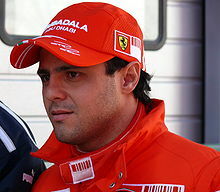 According to the Brazilian television station Rede Globo, Brazilian driver Felipe Massa, who finished the Singapore race in 13th having been leading at the time of Piquet Jr.'s crash, and eventually lost the 2008 World Championship to Lewis Hamilton by one point, did question Briatore about the crash at the time, although FIA president Max Mosley stated the sport could take no action based on "speculation". Fernando Alonso ended the 2008 season fifth in the Drivers Championship with 61 points, while Nelson Piquet Jr. finished in twelfth place, with 19 points. Their collective total earned Renault F1 fourth place in the Constructors Championship. Despite rumours that he was set to leave the team, Renault re-signed Piquet Jr. on a one-year contract for the 2009 season, once again alongside Alonso. By the tenth race of the 2009 season, Piquet Jr. had failed to score any points whereas Alonso had managed 13 for the team. On 3 August 2009, Piquet confirmed that he had been dropped by Renault. 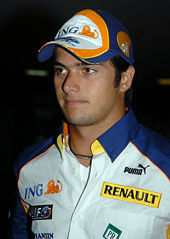 The departure was acrimonious, with Piquet Jr. criticising his former Renault F1 team and Briatore. 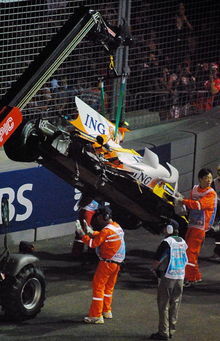 On 30 August 2009, reports by the Brazilian television station Rede Globo stated that Nelson Piquet Jr. was ordered to crash during the Singapore race. Formula One's governing body, the Fédération Internationale de l'Automobile (FIA), immediately announced it was investigating "alleged incidents at a previous F1 event". It was widely reported that the race in question was the Singapore 2008 race. On 4 September, following the investigation by the FIA, Renault F1 were formally accused of interfering with the outcome of the 2008 Singapore race and conspiring with Piquet Jr. In a statement, the FIA stated that the charges against Renault F1 included "a breach of Article 151c of the International Sporting Code, that the team conspired with its driver, Nelson Piquet Jr, to cause a deliberate crash at the 2008 Singapore Grand Prix with the aim of causing the deployment of the safety car to the advantage of its other driver, Fernando Alonso." The team was called to a meeting of the FIA World Motor Sport Council in Paris on 21 September, days before the 2009 running of the Singapore Grand Prix. After being charged, the Renault F1 team stated that they would be making no comments until the hearing. On 10 September, Piquet Jr. made the second of two statements to the FIA. On the same day, a transcript of Piquet Jr's first statement to the FIA made at their Headquarters in Paris on 30 July was published by F1SA.com (the F1 Supporters Association). In response to questions over its authenticity, the FIA president Max Mosley stated "I haven't seen anything which I believe to be a forgery." In the transcript, Piquet Jr. states that he was asked by Briatore and Symonds to crash his car at a specific corner. Alonso denied knowing of any plan to ask Piquet to crash, stating "I cannot imagine these things, these situations. It's something that never entered my mind." Nelson Piquet Jr. questioned whether Alonso knew that a crash was planned, citing that in his place, he would have questioned Renault's "senseless" Alonso race strategy of starting with a low fuel load and making an early pit stop on the twelfth lap. During the course of the investigation and before the WMSC hearing, Alonso was absolved of any blame by the FIA. On 11 September, Max Mosley, the FIA president confirmed Piquet Jr. would face no action after making his two statements, even if the case was found in favour of Renault. On 11 September, the day after Piquet Jr.'s statement to the FIA was leaked, Renault F1 stated that it intended to take legal action against Nelson Piquet Jr and his father in both French and British courts, stating that "...today the ING Renault F1 Team and its managing director Flavio Briatore personally wish to state they have commenced criminal proceedings against Nelson Piquet Jr and Nelson Piquet Sr in France concerning the making of false allegations and a related attempt to blackmail the team into allowing Mr Piquet Jr to drive for the remainder of the 2009 season". In response to the legal action, Piquet Jr. stated "Because I am telling the truth I have nothing to fear, whether from the Renault team or Mr Briatore – and while I am well aware of the power and influence of those being investigated, and the vast resources at their disposal, I will not be bullied again into making a decision I regret". On 14 September 2009, Pat Symonds was also reported to have been offered immunity from action if he provided the FIA with details of the alleged conspiracy. Symonds was reported to have told FIA investigators that the initial idea of a crash had come from Piquet Jr.
On 15 September, The Times newspaper published extracts of Renault F1 radio conversations transmitted before and after the Singapore race between Renault F1 personnel including Piquet Jr., Alonso, Symonds and Briatore. On 16 September the Renault F1 team announced it would not be contesting the charges at the meeting of the FIA World Motor Sport Council in Paris on 21 September, and stated that both Briatore and Symonds had left the team. The FIA confirmed that 21 September meeting would still go ahead following the departure of Briatore and Symonds, with sanctions against Renault F1 still possible. The day after the Renault announcement, Renault confirmed Briatore had resigned from the team, while Briatore himself stated of his departure that "I was just trying to save the team", "It's my duty. That's the reason I've finished." The extraordinary meeting of the World Motorsports Council took place on 21 September 2009 in Paris. After a ninety-minute hearing, the council imposed a disqualification on Renault, suspended for two years. This meant that if a similar incident occurred before 2011, Renault would be banned from Formula One. Briatore was banned indefinitely from any FIA-sanctioned event, while Symonds received a five-year ban. Furthermore, Briatore was indefinitely banned from managing drivers when the FIA stated that superlicences would not be issued or renewed to any driver associated with him in the future. Alonso was cleared of wrongdoing; the FIA found no evidence that he or his mechanics knew anything about the scheme. The council came down hard on Briatore because he denied his involvement despite overwhelming evidence. Symonds, in contrast, had confessed, expressing his "eternal regret and shame" for his role in the scheme. In announcing the sanctions, the council stated that Renault's actions were serious enough to merit being thrown out of Formula One altogether. However, it opted to impose a suspended sentence because Renault took swift action in forcing Briatore and Symonds to resign. The Daily Mirror described the de facto lifetime ban on Briatore as the harshest sanction ever imposed on an individual in the history of motorsport. A major contribution to the punishment of Briatore and Symonds was the testimony of the unnamed "Witness X", a Renault employee who was also present at the pre-race meeting but rejected the idea. The Daily Mail has reported that Witness X was Alan Permane, the team's chief race engineer. After Renault F1 were formally charged, the alleged offence was thought to be unprecedented within Formula One. The scandal followed two recent Formula One cheating scandals: a case of industrial espionage between teams (including Renault F1); and an instance of the 2008 World Champion Lewis Hamilton being found to have lied to race stewards in March 2009. The scandal interrupted the team's parent company Renault S.A.'s launch of four electric vehicles at the Frankfurt Motor Show after journalists questioned Renault chief executive Carlos Ghosn over the affair, who directed all inquiries to Bernard Rey, chairman of Renault F1. On 17 September, Patrick Pelata, Renault S.A.'s chief operating officer, first representative from Renault to officially comment on the Singapore crash affair, stated that "The [Renault F1] team believes that a mistake has been made, and punishment must follow. Flavio Briatore considered himself to be morally responsible and resigned" and that the team would defer making a decision on the future options for the team. Pelata added that he did not wish the actions of Briatore and Symonds to "reflect upon the whole company and the entire Formula 1 team". In addition, Ghosn also called for calm and for Renault to "not react in the heat of the moment" while the Renault F1 team collaborated with the authorities, adding that "I am confident when the facts are established, we can take a very clear decision". Former Jordan Grand Prix F1 team principal Eddie Jordan believed that the departure of Briatore and Symonds from Renault on 16 September was an effective admission of guilt. Former three-time Formula One World Champion and former team owner Sir Jackie Stewart said of the Singapore scandal that "There is something fundamentally rotten and wrong at the heart of Formula One. Never in my experience has Formula One been in such a mood of self-destruction. Millions of fans are amazed, if not disgusted, at a sport which now goes from crisis to crisis with everyone blaming everyone else." Former three-time Formula One World Champion and former Jaguar Racing team manager Niki Lauda, while comparing the Singapore incident to the 2007 espionage scandal, declared that "This [the Singapore crash incident], though, is new. The biggest damage ever. Now the FIA must punish Renault heavily to restore credibility in the sport." Former 1996 F1 World Champion Damon Hill described the Singapore crash as "not a very good episode" for the sport and said of the future of F1 that "I'm concerned the sport is going to suffer as a genuine challenge, which is what I always felt it should be and would like it to be, of skill and competitiveness". Former racing driver Eddie Irvine, who retired from Formula One at the end of 2002, believed that the response to the Singapore incident had been an overreaction, stating that "This [Singapore incident] is probably slightly on the wrong side of the cheating thing but in days past every team have done whatever they could to win – cheat, bend the rules, break the rules, sabotage opponents", "[t]his is just the FIA going on a crusade". He also speculated that the FIA would be lenient on Renault F1 and not expel them, due to the sport's current "shaky" condition after recent team departures. Chief Sportswriter Simon Barnes of British newspaper The Times sparked debate over the incident when he labelled it "the worst single piece of cheating in the history of sport" primarily because of its "potentially lethal consequences" to Piquet, the other drivers, marshals and spectators. Supporting Barnes, The Times' motor racing correspondent Edward Gorman cited the alleged top level pre-conceived elements of conspiracy that sought to sacrifice one team member to benefit another to put the incident on a par with controversies such as Ben Johnson, horse doping and illegal keels used in the America's Cup. Gorman then postulated that this incident was worse than those because Briatore and Symonds set in motion "an event of violent destruction, the consequences of which they could neither predict nor control." Matthew Syed countered that while the incident was premeditated, "unspeakably unethical" and dangerous, it was not nearly as reckless as the East German athletics doping scandal and other instances of long-term doping. Syed also argued that the Renault team would not have been expecting injuries to result from the crash, in contrast to incidents such as the assault on ice skater Nancy Kerrigan. Responding to Flavio Briatore's resignation from Renault F1, Formula One Management's Bernie Ecclestone stated that "It is a pity that Flavio has ended his Formula One career in this way", "You can't defend him at all. What he did was completely unnecessary. It's a pity that it's happened", although Ecclestone denied that the scandal would 'finish' the sport, citing the sport's recovery from the death of Ayrton Senna and the retirement of seven-time World Champion Michael Schumacher. Renault equipment on the pitwall at the 2009 Japanese Grand Prix with ING logos covered after the company ended their sponsorship. In response to the scandal Renault's main sponsors ING and Mutua Madrileña ended their sponsorship agreements with Renault early, within a week after the FIA's decision and right before the next race, the 2009 Singapore Grand Prix, with the team removing their logos from the cars before the event. Major sponsor Mutua Madrileña withdrew its sponsorship of the Renault F1 team first, just before the 2009 Singapore Grand Prix weekend, believing that the situation "could affect the image, reputation and good name of the team's sponsors." Mutua Madrileña did not withdraw sponsorship of Renault driver Fernando Alonso, as he was not implicated in the scandal. This was followed hours later by the withdrawal of title sponsor ING Group with immediate effect, who had been previously due to end their sponsorship of the team at the end of 2009. On 19 October 2009, Flavio Briatore announced his intentions to sue the FIA for his lifetime ban, claiming that "the FIA [had] been used as a tool of vengeance on behalf of one man" and that there were several miscarriages of justice, including a delay in summons, a failure to state the charges in advance and a lack of access to documents and "Witness X". On 5 January 2010, the French Tribunal de Grande Instance overturned his ban, and awarded him €15,000 in compensation. Symonds' ban was also overturned, and he was awarded €5,000 in compensation. Briatore was believed to be suing the FIA for damages in addition to getting his ban overturned, and has also stated his intention to pursue legal action against the Piquet family. On 11 January 2010, the FIA announced that they would appeal the decision of the Tribunal de Grande Instance to overturn the bans imposed on Flavio Briatore and Pat Symonds. The FIA reinstated the bans while the appeal was active, but stated that drivers managed by Briatore would be granted their superlicences for 2010. On 12 April, the FIA announced a settlement with Briatore and Symonds, and that the legal action had been ended. Both men agreed not to work in Formula One until 2013, nor any other FIA-sanctioned championship until the end of 2011. On 7 December 2010 it was announced that Nelson Piquet Jr and his father had won a libel case against Renault at the High Court based on the allegations described above. Renault apologised to the Piquets and paid them substantial damages. Admitting they libelled the duo, a Renault statement read: "The team accepts, as it did before the World Motor Sport Council, that the allegations made by Nelson Piquet Junior were not false. As a result, these serious allegations contained in our press release were wholly untrue and unfounded, and we withdraw them unequivocally. We would like to apologise unreservedly to Mr Piquet Junior and his father for the distress and embarrassment caused as a result. As a mark of the sincerity of our apology and regret, we have agreed to pay them a substantial amount of damages for libel as well as their costs, and have undertaken not to repeat these allegations at any time in the future. It also accepts that Mr Piquet Junior and his father did not invent these allegations to blackmail the team into allowing him to drive for them for the remainder of the 2009 season." It was suggested in the media that if Briatore were personally found guilty of race-fixing, he might fail the English Football League's Fit and proper person test which applies to football club owners and directors, whose regulations exclude people who are "subject to a ban from a sports governing body relating to the administration of their sport", though a BBC report opined that his position might be secure given that he had left Renault. The Football League stated that they would wait for the conclusion of the investigation before examining Briatore's fitness to continue to be a director of Queens Park Rangers F.C.. The Football League board discussed the matter on 8 October 2009 and declared that they would be awaiting a response from Briatore to various questions before commenting further. In addition to any sporting sanctions by the FIA, Renault, Piquet Jr. or even Felipe Massa could take legal action over the incident. It was speculated by the media that Briatore and Symonds could be extradited to Singapore to face criminal charges relating to the incident, which according to one lawyer could encompass "causing malicious or willful damage to property, endangering a vehicle and criminal conspiracy to commit a serious crime". This was thought to be unlikely however, with the Singaporean authorities believed to be unwilling to attract the negative publicity charges it would create, and also complicated by the fact that Singapore has an extradition treaty with the United Kingdom (Symonds being a British citizen) but not Italy (Briatore being an Italian citizen). Piquet Jr. was criticised by many in the community and some suggest that the controversy effectively ended his hopes of continuing in F1. BBC F1 commentator Martin Brundle suggested that Piquet Jr. was now unemployable in Formula One, saying that no team or sponsor would want to be associated with the Piquet family. Brundle noted that Piquet Jr. "didn't deliver at Renault, he wasn't fast enough, that's why he was released and that's why he has dropped hand grenades into the system ever since". Brundle was also highly critical that Piquet Jr. escaped sanction from the FIA despite admitting to race-fixing, while the others involved were heavily punished. Other leading F1 figures have echoed Brundle's sentiments. Toyota team principal John Howett was quoted as saying, "I think on his performance...disregarding the issue, I probably would not give him a drive and I would probably be further influenced in that decision by what took place." Christian Horner, team principal of Red Bull Racing, has added, "I don't think we would have any interest [in Piquet Jr.] at Red Bull Racing." Piquet Jr. has since joined America's NASCAR circuit, starting in the Camping World Truck Series and Nationwide Series in 2010. He drove for Turner Scott Motorsports part-time in the #30 Chevrolet Silverado in the Camping World Truck Series and full-time in the #30 Chevrolet Camaro in the Nationwide Series. In 2014-2015 Piquet Jr. took part in the inaugural Formula E season with China Racing, eventually becoming Formula E's inaugural champion by a single point over Sébastien Buemi. ^ Smith, Ben (21 September 2009). "Renault given two-year suspended ban in Crashgate hearing". The Times. London. Retrieved 2010-05-22. ^ a b "Nelson Piquet Jr and his father win Renault libel case". BBC Sport. 7 December 2010. Retrieved 16 December 2010. ^ a b "Renault handed suspended F1 ban". BBC Sport. 21 September 2009. Retrieved 22 May 2010. ^ a b "FIA Press Release". Fédération Internationale de l'Automobile. Archived from the original on 4 October 2009. ^ a b Noble, Jonathan (5 January 2010). "Court overturns Briatore's F1 ban". autosport.com. Haymarket Publications. Retrieved 5 January 2010. ^ a b Elizalde, Pablo (12 April 2010). "FIA, Briatore reach settlement". autosport.com. Haymarket Publications. Retrieved 12 April 2010. ^ a b "Football League looks at Briatore". BBC Sport. 21 September 2009. Retrieved 13 September 2013. ^ Asthana, Anushka; Sherman, Jill (18 September 2009). "Nelson Piquet Sr to begin court fight against Flavio Briatore". The Times. London. Retrieved 18 September 2009. ^ a b c Cary, Tom (17 September 2009). "Q and A: why Renault face race-fixing allegations and other questions". The Telegraph. London. Retrieved 17 September 2009. ^ a b c "Renault blames Briatore & Symonds". BBC Sport. 17 September 2009. Retrieved 17 September 2009. ^ a b c d Hamilton, Maurice (4 September 2009). "FIA charges Renault over Nelson Piquet Jr crash in Singapore". The Guardian. London. Retrieved 17 September 2009. ^ "Singapore GP – Sunday – Press Conference". GrandPrix.com. Inside F1, Inc. 28 September 2008. Retrieved 6 September 2009. ^ a b c Gorman, Ed (17 September 2009). "A load of utter rubbish from Renault after a "complicated" night for Nelson Piquet". Formula One Blog. The Times. Archived from the original on 22 September 2009. Retrieved 18 September 2009. ^ "Grand Prix Results, Singapore GP, 2008". GP Encyclopedia, Races. grandprix.com. 28 September 2008. Archived from the original on 18 September 2009. Retrieved 18 September 2009. ^ Arron, Simon (5 November 2008). "Fernando Alonso and Nelson Piquet to stay with Renault in 2009". Daily Telegraph. London. Retrieved 17 September 2009. ^ Elizalde, Pablo (3 August 2009). "Angry Piquet confirms Renault exit". autosport.com. Haymarket Publications. Retrieved 17 September 2009. ^ Hamilton, Maurice (31 August 2009). "Renault may quit Formula One over new cheating claim". The Guardian. London. Retrieved 13 September 2009. ^ "F1 launches Singapore race probe". BBC News. 31 August 2009. Retrieved 17 September 2009. ^ a b "Renault summoned by FIA's WMSC". autosport.com. Haymarket Publications. Retrieved 17 September 2009. ^ a b c Dart, Tom (11 September 2009). "Renault to start legal action against Nelson Piquet Jr over crash claims". The Times. London. Retrieved 17 September 2009. ^ "Transcript of Nelson Piquet Jr's statement to the FIA". Yahoo! Eurosport UK & Ireland. Archived from the original on 15 September 2009. Retrieved 17 September 2009. ^ a b Dart, Tom (11 September 2009). "Nelson Piquet Jr granted immunity from prosecution in Renault 'crash-gate' scandal". The Times. London. Retrieved 17 September 2009. ^ "Alonso 'surprised' by fix claim". BBC Sport. 10 September 2009. Retrieved 17 September 2009. ^ Cary, Tom (18 September 2009). "Singapore crash: Nelson Piquet Snr takes step back from Fernando Alonso allegation". The Telegraph. London. Retrieved 18 September 2009. ^ a b Cary, Tom (17 September 2009). "Q&A: what will be the fallout from the Renault Fomula One race-fixing scandal?". The Telegraph. London. Retrieved 18 September 2009. ^ "Renault to launch Piquet lawsuit". BBC Sport. 11 September 2009. Retrieved 17 September 2009. ^ a b "Singapore transcript reveals Flavio Briatore's anger at Nelson Piquet". The Guardian. London. 15 September 2009. Retrieved 17 September 2009. ^ Gorman, Edward (15 September 2009). "'Nelson Piquet Jr's had a crash. It's huge. Is he all right? Is he all right?". The Times. London. Retrieved 17 September 2009. ^ a b c "Briatore out over Renault fix row". BBC Sport. 16 September 2009. Retrieved 17 September 2009. ^ a b Dineen, Robert (17 September 2009). "Renault chief admits 'Crashgate' has damaged company". The Times. London. Retrieved 17 September 2009. ^ "Briatore: I did it for Renault". Sky Sports. 17 September 2009. Retrieved 17 September 2009. ^ a b Noble, Jonathan (21 September 2009). "Renault given two-year suspended ban". autosport.com. Haymarket Publications. Retrieved 2009-09-21. ^ "FIA hands individual punishments to Briatore and Symonds". Formula One. 21 September 2009. Retrieved 13 September 2009. ^ Young, Byron (21 September 2009). "Renault owner Flavio Briatore slapped with lifetime F1 ban". The Daily Mirror. London. Retrieved 21 September 2009. ^ McEvoy, Jonathan (25 September 2009). "Queens Park Strangers: F1 chief Bernie Ecclestone says Flavio Briatore ban is harsh – and that he no longer talks to him". The Daily Mail. London. Retrieved 29 September 2009. ^ Sage, Adam (17 September 2009). "Renault fearful of dent to global brand". The Times. London. Retrieved 17 September 2009. ^ "Renault chief calls for calm". UK Press Association. 17 September 2009. Archived from the original on 17 September 2009. Retrieved 17 September 2009. ^ a b c "Singapore crash: what they are saying". London: The Telegraph. 17 September 2009. Retrieved 17 September 2009. ^ "Teams do anything to win – Irvine". BBC Sport. 17 September 2009. Retrieved 17 September 2009. ^ Barnes, Simon (17 September 2009). "The worst act of cheating in the history of sport". The Times. London. Retrieved 18 September 2009. ^ a b c Asthana, Anushka; Sherman, Jill (18 September 2009). "Are Renault really the worst villains?". The Times. London. Retrieved 18 September 2009. ^ "Briatore says he sacrificed himself for team". Yahoo! Eurosport UK & Ireland. 17 September 2009. Archived from the original on 17 September 2009. Retrieved 17 September 2009. ^ Elizalde, Pablo (25 September 2009). "Renault removes ING, Mutua logos". autosport.com. Haymarket Publications. Retrieved 13 September 2013. ^ "Briatore ban too harsh – F1 boss". BBC Sport. 24 September 2009. Retrieved 24 September 2009. ^ Rogers, Iain (24 September 2009). "Spanish insurer cancels Renault sponsorship". Reuters. Retrieved 24 September 2009. ^ "Title sponsor ING axes Renault backing". Motorsport.com. 7 October 2009. Retrieved 13 September 2013. ^ Noble, Jonathan (18 October 2009). "Briatore takes FIA to court". autosport.com. Haymarket Publications. Retrieved 19 October 2009. ^ Gorman, Edward (6 January 2010). "FIA considering appeal after bans on Flavio Briatore and Pat Symonds lifted". The Times. London. Retrieved 6 January 2010. ^ Lostia, Michele; Beer, Matt (6 January 2010). "Briatore plans action against Piquets". autosport.com. Haymarket Publications. Retrieved 6 January 2010. ^ "FIA to appeal against decision to Flavio Briatore ban". BBC Sport. 11 January 2010. Retrieved 11 January 2010. ^ "Piquet duo win libel case over Renault". CNN. 7 December 2010. Retrieved 13 September 2013. ^ Kempson, Russell; Jacob, Gary (17 September 2009). "'Crashgate' could force QPR to find new owner". The Times. London. Retrieved 17 September 2009. ^ "Briatore's QPR fate put on hold". BBC Sport. 8 October 2009. Archived from the original on 8 October 2009. Retrieved 8 October 2009. ^ a b "Singapore unlikely to extradite Flavio Briatore and Pat Symonds". The Guardian. London. 18 September 2009. Retrieved 2009-09-18. ^ "Disgraced F1 pair could face S'pore extradition". Business Times. Singapore. 20 September 2009. Retrieved 2009-09-21. ^ Brundle, Martin (14 September 2009). "Piquet 'now unemployable in F1'". BBC Sport. Retrieved 23 September 2009. ^ Ferdinand, Dan (11 August 2009). "Nelson Piquet can expect a paddock backlash for deliberately crashing his Renault at last year's Singapore Grand Prix". Daily Mirror. London. Retrieved 23 September 2009. ^ "Little support for Nelson Piquet". F1-Live.com. 2 October 2009. Retrieved 3 October 2009.